No cash for iPhones. Leopard a success. Security firm questions Leopard Firewall. Possible bad Macbook drives. Mac trojan in the wild. Leopard launch party coverage. Upgrading gotchas. Some of my favorite things so far. What’s missing… How to scroll inactive windows in Leopard. How to quick activate QuickLook. How to move apps and windows between Spaces. 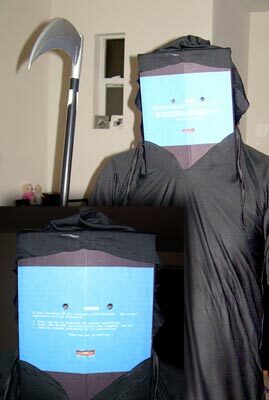 For Halloween this year I decided to go as one of the most feared creatures in all of techdom. The dreaded Blue Screen of Death (BSoD). Bwahhaahhahhhhh! CS Odessa today announces the release of ConceptDraw MINDMAP 5.2, a new version of its mind mapping business productivity software. The update adds Mac OS X 10.5 Leopard compatibility, Quick Look technology support, integration with iCal and renewed user interface that supports Leopard’s rich visual look-and-feel. ConceptDraw MINDMAP 5 is an easy-to-use tool that supports mind mapping and brainstorming techniques as well as many other personal productivity methodologies. It provides businesses and individuals with an engaging and creative way to increase efficiency and productivity when organizing ideas and projects, or when communicating with a group of people. The Audioengine 2 Premium Desktop Multimedia Speaker system (A2) has just been released. The A2 is designed to produce excellent sound quality and is small enough to fit comfortably on your desktop. The hand-made wooden speaker cabinets house Kevlar woofers and silk tweeters, producing a rich range of tones. There are two audio inputs (RCA and 1/8″ mini jack), and a volume control can be found on the back panel. All required cables are included. The A2 is compatible with a wide variety of items, including: iPods and other music players, computers, televisions, cd and dvd players, cell phones, and video game consoles. It also supports with the Apple remote as well as other remotes. Audioengine 2 Speaker systems are available for $199 US and can be bought at any authorized reseller or on the Audioengine website. While most of us Mac users will have a pain-free, ‘easy does it’ half-hour upgrade to Leopard this weekend, others may be surprised at what’s broken or causing a conflict with the new cat in their Mac. As I began my own in-house clean up, I thought I might pass along a few tips for others who will be an early adopter of Leopard. It can never be said enough, or practiced enough- there is never a backup that’ll you do that you’ll curse, save for the times when you overwrite an existing backup you later realize you need. When leopard hits and Apple’s own built-in, dead-simple approach to backing up your files with Time Machine lands on Mac desktops & hard drives everywhere, perhaps this message will become less important. But before you upgrade, it’s the single most important step. With a full bootable backup, you can botch your upgrade beyond any tawdry 1.1.1 iPhone bricking ever done, and still in a moment’s grace boot from your backup and recover. Consider CarbonCopyCloner (already Leopard ready) from Bombich Software to make your bootable clone. Excited about Leopard’s super cool groovy new features, but your Mac doesn’t meet the stiff new system requirements? According to Apple, Mac OS X 10.5 Leopard cannot be directly installed on Macs with a G4 processor slower than 867 MHz. However, provided that you have access to a Leopard compatible Mac, there is a workaround. I discovered while trying to get Leopard working on my 800 MHz Titanium Powerbook, that while it can’t be installed directly, it will run from a drive with Leopard already installed. So here is what needs to be done. First, get a Leopard compatible Mac. Take the older Mac start it up in target disk mode and connect it to the LCM (Leopard Compatible Mac) via a Firewire cable. Insert the Leopard installation disk in the LCM and start the installation process. When the installer asks where Leopard is to be installed, specify the Target Disk Mode connected Mac’s hard drive. Complete the installation process and once the LCM has happily booted from the new system shut it down, disconnect the older Mac, and power it down. Start the older Mac up and it should now be running Leopard. That’s not a typo, Despite the excitement and fervor to rush out and upgrade to the newest cat in Apple’s litter, there are actually good reasons not to upgrade to Leopard right away. Here are five to consider. Technology always needs early adopters, brave souls living on the bleeding edge trying each new electronic gadget or software program because they are driven to be the first. They are the ones who take the punches, suffer the glitches, crashes, and report the bugs that are inevitable with new technology and software, and many times provide workarounds and fixes. More cautious Mac users should follow the basic tech rule, “Never buy version one of anything.” Some may argue Leopard is just the evolution of the current Mac OS, and while it’s Officially Mac OS X 10.5, it’s still version one of Leopard. Wait a few weeks after Leopard’s release into the wild to see what problems, gotchas, and solutions the first adopters discover. This makes transitioning from Tiger to Leopard smoother and less painless. Places to check to see what is going on with Leopard include Appleâ€™s support site for Mac OS X (www.apple.com/support/leopard/) where there will be technotes regarding problems and solutions, and forums where other users discuss their experiences; our own MacCast, as well as MacFixit.com (www.macfixit.com) and Macintouch (www.macintouch.com). there were different pictures for Macs and PCs on the network. Stupid me. I though I was being smart by pre-ordering Leopard on-line so that I could get my copy in advance of the 6:00 PM retail launch time. It was a great idea and I was even more excited this morning when I began seeing images and getting reports from listeners who were already receiving their copies. Last night I had checked my tracking info and saw that my copy of the fast cat was already in Texas and due to arrive on my doorstep by 10:30 AM PST. My plan was working, joy! Today, I patiently awaited my kitties arrival. The anticipation was exciting, but much to my dismay 10:30 came and went. At 10:32 AM I went on-line to check the package’s status and was met with the horror you see above. The package was in Indiana at 4:47AM?! How could that be if it was due to be on my doorstep in California at 10:30AM? 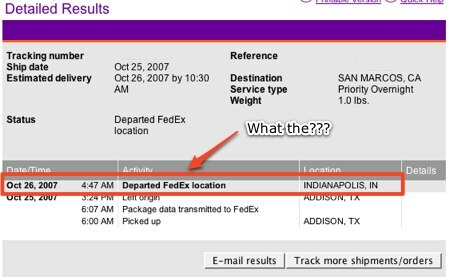 Does FedEx already have teleporter technology they aren’t telling us about? Nope, FedEx had screwed me. I called, they placed a “trace” on the rouge feline, and said they would call later to let me know where she was (yes OS X is a woman). Well, I just got the call and was told that my copy of the latest OS is stuck on the ramp in Indianapolis and won’t be delivered until Monday. Thank you FedEx. Enjoy the party everyone, hopefully it’s still going when I can join in next week. A podcast about all things Macintosh. For Mac geeks, by Mac geeks. Show 204. Leopard pre-release special. New Mac Pros waiting for Intel? French to sell legit unlocked iPhone. iPhone will get an Apple blessed SDK. iJailBreak brings AppTapp back to iPhone. Mac OS X Leopard is coming. Who should upgrade? Why upgrade? Over 300 new features. Buying Leopard. Installing Leopard. Some details on Time Machine. Early Leopard reviews. Reports of early shipments. Smile on My Mac, New, Textexpander 2! Audible.com, Get your free audiobook.